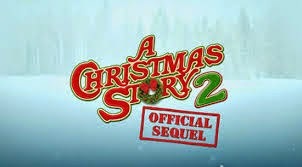 A Christmas Story 2, referred to in its trailer as A Christmas Story 2: The Official Sequel is set 6 years after the original, and Ralph is about to turn 16. If such a thing is possible, the plot is slightly less defined than it was in the original. Once again, we get a series of loosely connected events which make little to no sense and involve someone's tongue stuck on something. The movie's main conflict focuses on a car Ralph dreams of owning. He accidentally damages it at the dealership and owes $85. This leads to him and his friends taking jobs at a department store right before Christmas. Despite being desperate and determined, they behave idiotically. The results aren't funny, though they manage to generate a sense of awkward embarrassment that will make you hate and/or pity everyone who worked on this movie. Meanwhile, Ralph's cheapskate father is trying to save a few bucks by ice fishing to catch Christmas dinner. Yup. Believable and interesting: you won't resent a single one of the ten or fifteen minutes of your life you waste on this subplot. Oh, did I mention the obligatory street urchin, the random love interest (who's given all of two minutes of screen time, about a third of which is spent being threatened by a Nazi interrogator in a dream sequence), or the seemingly endless barrage of references from the first movie? I didn't? Good: I was planning to gloss over those. The movie ends the way these things typically do, with everyone learning lessons, coming together, and getting everything they wanted. Not only is Ralph's pointless debt resolved, he miraculously gets the girl and car (is his stingy dad secretly rich or something?) and drives off into a CG sunset. It's the sequel no one asked for, but it's what A Christmas Story probably deserved. Needless to say, if it's a choice between seeing this and undergoing a root canal performed by a Nazi war criminal, you might as well get your teeth fixed out of the deal.